Getting around Mexico City can be a challenge. 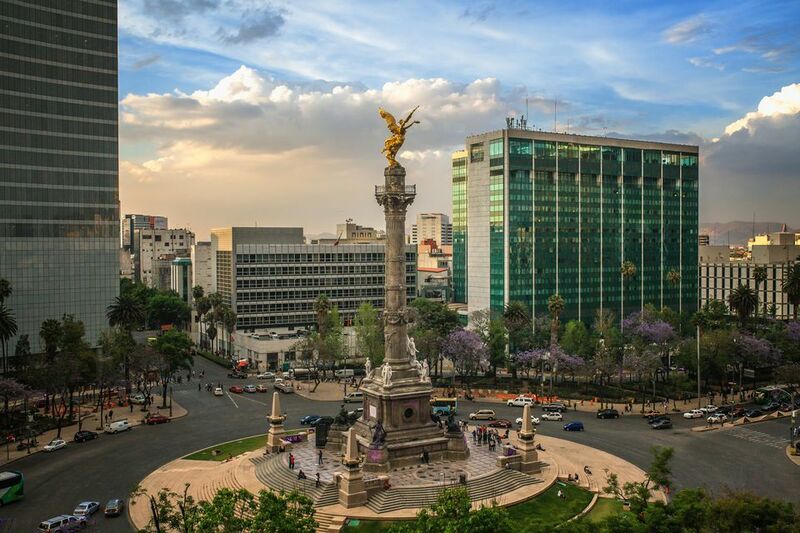 A good option for tourists is the Turibus, a double-decker Hop-on, hop-off sightseeing bus service that makes a circuit from the historical center, down the Paseo de la Reforma to Chapultepec Park and into trendy neighborhoods such as Condesa, Roma, and Polanco. It's an easy way to get to important tourist attractions throughout this big city and offers a good vantage point for seeing the sights and getting a grip on the layout of the streets and neighborhoods. Yes, the Turibus Is "Touristy"
I had been to Mexico City several times before I took the Turibus. Previously I had always gotten around the city by metro and found it a convenient and practical way to get from one place to another. Also, I must admit that whenever I saw those red double-decker buses I felt, as independent travelers often do, a sort of disdain for the passengers—those unadventurous folks who, instead of experiencing the "real" city the way the locals do, view it all from the remote perspective of a tour bus. My disdain wasn't so great that I wouldn't consider counting myself among their ranks, however. On a trip to Mexico City with my mother and young daughter in tow, we decided that instead of marching her up and down stairs, on and off metro cars and through tunnels to see all the sights on our list that day, we would purchase day passes for the Turibus. That day made me a convert. Particularly in a city as large as Mexico's capital, seeing it all from the vantage point of the Turibus will give you an appreciation for the layout of the city, the architecture of the Centro Historico, the numerous monuments along Paseo de la Reforma, the extent of Chapultepec Park and how they all fit into the mosaic of modern-day Mexico City. Before that experience I had perceived the city from a mole's perspective: ground level and underground tunnels. I have great admiration for the efficiency of Mexico City's metro system, which transports some five million users every day for the extremely low price of about six pesos (roughly $0.30 cents). For the simple expediency of getting from one place to another, the metro can't be beaten. For a day of sightseeing, however, the Turibus is an excellent option. You can get on and off at any of the stops as many times as you like for the day. You have the option of listening to a recorded commentary with a headset that gives information about the buildings, monuments, and neighborhoods you pass through. The Turibus passes by the stops about every half hour between 9 a.m. and 9 p.m. daily. The tour takes 2.5 hours minimum, but total time depends on how many stops you get off at. Riding the Turibus will help orient you if you're new to the city. It's safer than taxis or the metro and much less stressful. You can see where you're going, especially if you sit on the upper deck (just don't forget to bring a hat and sunscreen). Turibus excursions are also offered to the ​Teotihuacan archaeological site, departing daily from the Mexico City Zocalo. The eight-hour tour includes transportation, lunch and a guided tour of the site. You can also ride the Turibus in Merida, Puebla, and Veracruz.